Fat Bruce Lee, Chi Burger, Special Guest, and I were all feeling that gnawing sensation in the pits of our stomachs, and only a cheeseburger was going to satisfy that hunger. I had noticed a number of happy and satisfied reviews for Hearty Deli, and I wanted to count myself as part of that group. Hearty Deli boasted really low prices, and an inexpensive go-to joint...well, who wouldn't want that? There was plenty of metered parking on the street, and we experienced a wait time of zero minutes and zero seconds, since we were the only ones there at noon on a Friday. We were too dumb to get the hint, so we ordered away. Our burgers were ready in about 4 minutes. We waited for our meals at the small collection of tables near the order window. The Beef: Blah. The burger patties were so thin that they became convex (or concave--depending upon one's perspective) as they cooked on the griddle. This was California Burgers all over again. The sub-4 ounce patties were bland, dry, rubbery and only slightly beefy. The beef was clearly pre-formed, and I assumed that it was 80:20 Chuck. The Seasoning: The was no seasoning. The Sear: The hot griddle put a sear on the cheese side of the Frisbee-like patty, but the concave side was unseared in the center. The Preparation: The kitchen at Hearty Deli was swift, and they delivered our meals with great efficiency. The burgers were cooked to an aggressive Well-Done. The beef was ground very finely prior to being machine-formed in a factory far away. 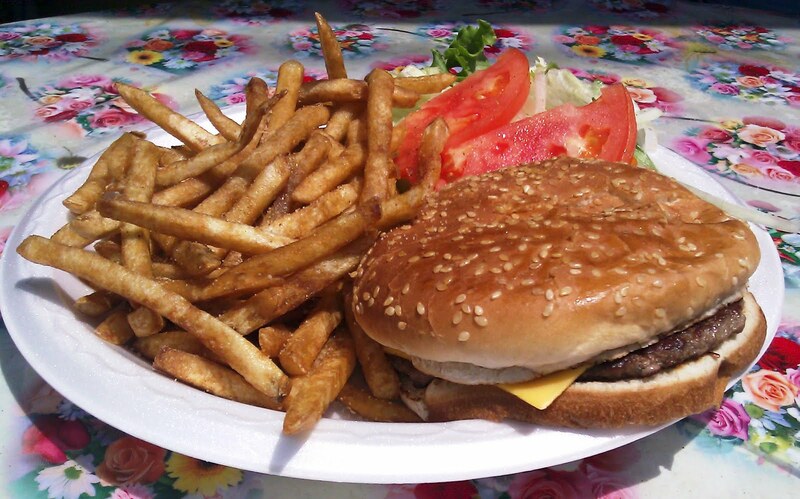 The Cheese: The single slice of American cheese on my burger was properly melted, and it was able to contribute moisture, salt, and a little umami to the bite. The Bun: The standard, seeded, hamburger bun was fresh, moist, neutral, and quite thoroughly toasted. The bun was moist enough to compensate for the dry beef. The cheese helped, too. The Meat To Bun Ratio: The bun was a little ahead of the beef but not by much. The Fries: The peel-off, previously frozen fries were served unseasoned, but there was a shaker of seasoned salt at the pickup window. The fries were brown and crisp. Unfortunately, the oil in which they were cooked was a little rancid, and the fries picked up that unpleasant flavor. The Toppings: The Iceberg lettuce was fresh, and the tomato slices were red, ripe, and juicy. The Value: It was $4.80 for a single cheeseburger combo, which included fries and a large drink. The value was good at Hearty Deli. 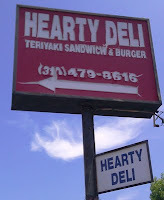 I had hoped to declare Hearty Deli as my inexpensive, go-to burger joint. That did not happen. 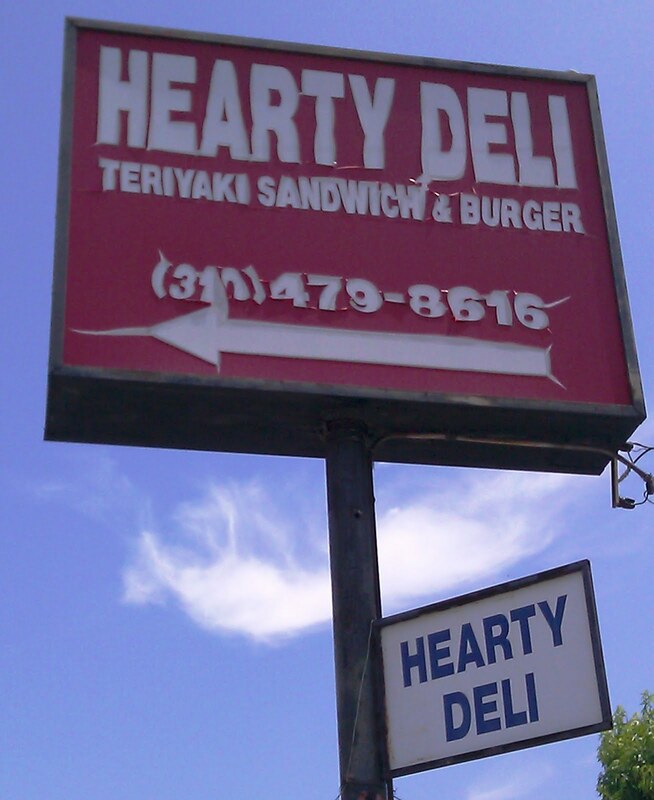 Hearty Deli served up a slightly below average burger at a great price. The chicken teriyaki breakfast burrito looked pretty intriguing, though. Burger Review : A slightly below average burger at a good price.